It seems that no other natural stone provokes the "I must have it!" feeling like white Carrara marble. It's gorgeous. But acidic foods and drinks etch marble countertops leaving dull spots all over creating extra maintenance. Not good for a kitchen countertop. Luckily, if you want marble countertops but not the maintenance problems, you have alternatives. 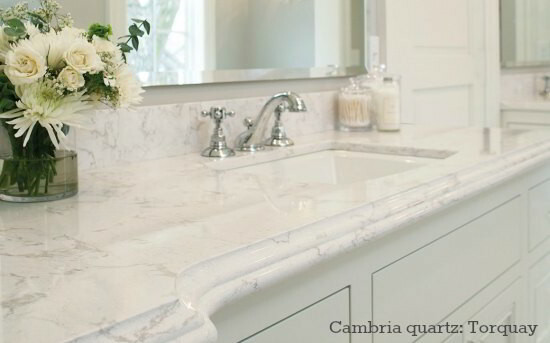 Casa Blanca granite, Glacier White granite, and Bianco Romano granite all look wonderfully like white Carrara marble. Additional options include various white quartz and quartzite colors I share below. First, you may wonder if marble is really that much trouble since you see marble kitchen countertops splashed all over the magazines and online. Many designers don't know better or will use it regardless of maintenance issues just because it looks so spectacular. But kitchen countertops need to be functional and the extra maintenance of marble is irritating to most homeowners. Keep in mind..... white Carrara is pretty distinctive. Expecting an exact match is a stretch. Also, not all Carrara marbles look alike. Some are very white with little veining. Others more gray with scads of veins. Which you prefer will color your choice of the alternatives. Casa Blanca granite is one to check out. Many slabs have a veining effect mirroring marble. Bianco Romano granite is certainly a contender. Usually, it has beautiful veining. Beola Ghiandonata can look much more like marble than granite. It is typically more gray so that may not suit you, but it has a linear striation pattern like white Carrara marble. Glacier White granite can be a light gray-white with striations similar to marble veins, or it can be a darker gray with a more mottled and typically "granite" type pattern. It's a good one to take a peak at in your local stone warehouse. It may be off the mark, but you never know. Be a savvy stone shopper and always perform the lemon juice test on the exact slab you are considering. This test will tell you how absorbent (prone to staining) the stone is and if it is sensitive to acids like marble. Avoid Kashmir White granite. The pleasing pattern and color of this granite make it popular, but it is usually very porous and easily stained. Sealing often does not help. Quartzite countertops have become very popular in recent years as whites and grays are on trend. Quartzite is a hard stone with performance properties similar to granite countertops but can be mistaken for marble. White Fantasy is a quartzite popular for its marble look-a-like color and pattern. The veining does tend to be dense and the color is usually a touch on the gray side. White Princess is another quartzite that brings marble to mind. In truth, White Fantasy and White Princess quartzite often look very similar. Said another way... you may find nearly identical slabs one named "Fantasy" the other "Princess" or "Super White". Or distinctly different quartzite slabs both named White Fantasy. You may even see it called "granite" instead of quartzite. This is not true, so don't let it confuse you. Naming preference will vary so no need to get hung up on a particular name (".... oh, no I want White Fantasy, not White Princess..."). It will only make the search more confusing. this with granite, marble, and all natural stones. Names of specific varieties are not always strictly applied and you may find wide variation in the look of any stone with the same name or stones that look identical but with different names. Looking for a specific color name is a good place to start, but ultimately the name doesn't matter. You want to hunt stone warehouses for a slab with the color, tone and pattern you like regardless of the name. Quartzite can make an excellent, low-maintenance kitchen countertop much like granite... if you choose the right slab that is, so be warned! It is thought that some quartzite may etch, but this is not likely accurate. More likely is that a marble slab was mislabeled as "quartzite" since they can look very similar. Naming stone is not a strict science in the industry so it's always best to test and avoid any problems. If indeed you do get etching on quartzite, you'll need professional help to repolish it since it is very hard. But again, this is probably how you'll discover that you have marble and not quartzite. Marble is soft and DIY solutions for etching are available. To pick the perfect quartzite slab perform the lemon juice test as noted above to weed out those that etch. Not to be confused with the natural stone "quartzite" above, quartz countertops are an engineered stone with properties similar to granite. Color choices from the major quartz counter top manufacturers (Silestone, Caesarstone, Cambria, Zodiaq) have progressed far beyond the plain speckled patterns of old. New and intriguing patterns are popping up all the time including several with a similar look to Carrara Marble. Still Must Have Carrara Marble? 1. Have it honed and seal it often. The color / pattern won't show through as much as a polished surface, and a honed finish is more prone to staining, but etch marks are less visible. 2. Install it polished and learn to restore etch marks. A polished finish is very stain-resistant, but etch marks are more visible. On the plus side, etching is far easier to repair using this simple DIY marble etch remover and polisher. Either way, marble countertops will always be more maintenance-intensive than granite, quartzite, or quartz even if you are maniacally diligent with care and cleaning. It's a matter of expectations. If you know what you are in for with a marble kitchen countertop, then do it.... but I don't recommend it. You may think you can handle it, but later get sick and tired of the extra care. Again, marble countertops are only a problem in the kitchen due to all the acidic foods and drinks. So, stone pros and designers are right to warn you and suggest you consider marble vs. granite or other countertop materials. Elsewhere in the house... marble is no problem. It's much less stressful to have a kitchen countertop that is beautiful and yet so tough you'd have to really try to damage it... worry-free cooking. This is easy to accomplish by choosing one of the Carrara marble alternative countertop materials presented above. Many beautiful colors available. 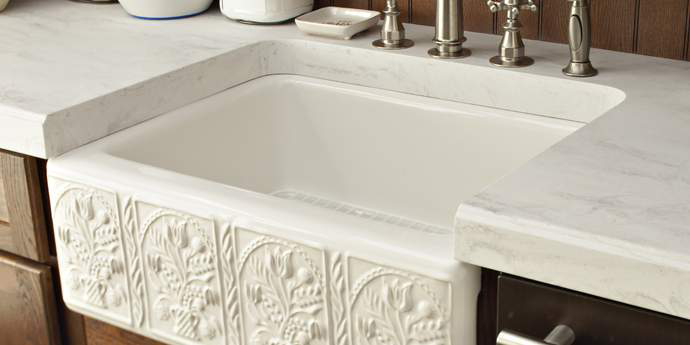 Then satisfy your Carrara craving by putting it in a bathroom! Comments for Which Granite looks like White Carrara Marble? Bundle to bundle of natural stone looks different no matter what distributor or fabricator calls it. The discrepancy between Quartzite (actual geological harder than granite stone) and Soft Quartzite (Industry created term for Marble Hybrid) are clearly misleading because it's so hard to sell marble,"high maintenance". All natural stone needs to be sealed, maintained. Why not recommend all marble, honed period for countertops? It has a luxurious, casual satin feel. Any etching can be repaired by gently rubbing with fine furniture grade steel wool. If properly sealed staining shouldn't be a prob. The etching and staining is unsightly on a polished finish. Period. All the high maintenance so much work, gimme a break. Any natural stone needs some maintenance. The marble look quartz, engineered, burns btw, because it has less quartz and more resin to get that look now a days. It can't be repaired like natural stone, it has to be replaced. Good luck with the warranty department on that and it's more expensive overall. The author makes some great recommends on alternatives but at the end of the day it's about the finish with Marble. Everything you hear or see is based on a polished finish. I totally agree with you on Kashmir White in the kitchen. We went through Costco to get our counter tops for our kitchen 15 years ago and I wish the designer we worked with would have told us not to get it. We started out being very careful in cleaning and polishing it but then got too busy (or lazy). The granite took on darker shades in high use areas where it is stained. You don't even realize it at first until you look at low use areas (like corners or under appliances) that are much whiter and brighter. I tried lots of DIY methods to remove the stains but it nothing worked. Sure wish we had known. Kashmir White is NOT porous! I've had polished kashmir white in my kitchen for 12 years and it's a durable granite. There isn't a stain, scratch, mark or chip anywhere. And our family with 3 kids is extremely hard on our kitchen. In fact I chose it for it's durability. Many stone yards call it River White now. Well, it is a very porous stone, however, not every slab is equally porous. Granite is a natural stone and thus has a lot of variation. You may have gotten a bit lucky with yours, sealed it well and have cleaning habits that don't let spills sit for too long. Yes, it is durable like any granite and won't scratch, or chip, or etch and can take the heat, but typically very porous and stains easily. I can tell you for certain that your experience is extremely rare for Kashmir white granite. But that is great for you! Corian like Marble or Granite?? NO! Come on, all these comments about which Silestone looks most like marble or granite. Are people going into showrooms with dark sunglasses on or something?? We followed lots of online advice and so went to see a Silestone Blanco Orion in a showroom on a full kitchen display. Within seconds of walking in (it was the first Silestone we had seen and apparently within their higher price ranges) we looked at each other with dismay. At best it looks and feels like a very well designed and put together, sealed laminate. It has a very obvious 'repeat' pattern unlike natural stone, it has none of the shine of granite or marble (but much more a synthetic sheen like laminate), it feels warm and artificial (like laminate). And it costs as much as many marbles and granites! I accept it may by much much better wearing and maintenance free than any of marble, granite or actual laminates, perhaps by many times ... and if practicality is what you're after, then maybe it is for you. But please let's not pretend it has any of the aesthetics of real stone ... even if it is made with bits of real stone. It is and it looks man-made, not natural. My view: if you're after granite or marble for the look, then Silestone, etc. will not get you that! If you're after a PATTERN or DESIGN like marble or granite (which is very different to the overall actually looking like marble or granite) then yes, Silestone gets you in that direction (as does laminate to be fair) but other than pattern it has none of the other elements that make up the look of real stone. If I bought it, I would end up saying to friends who comment... "no it's not laminate, it's really really good quality pretend natural stone. That it costs more than natural stone but is easier to maintain"
Rain Cloud by Corian looks exactly like carrara marble and has the same matte finish. Check out quartz! 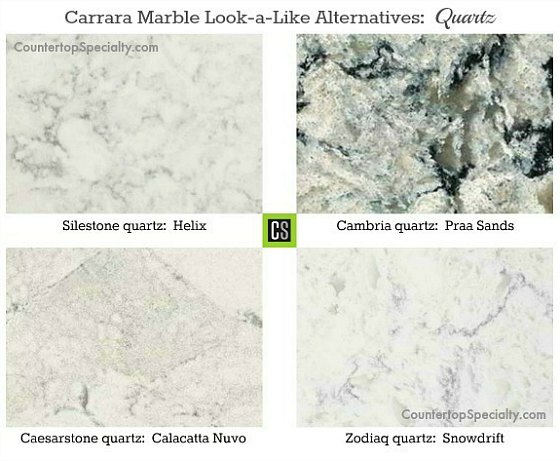 They are getting really close to the Marble look...especially Compac Brand and it's actually called "Carrara". The company only sales the stone by the slab so unless your lucky on the sq it could get costly... At least this has been my research and subject to change of course! Check out other brands like Silestone "lyra". 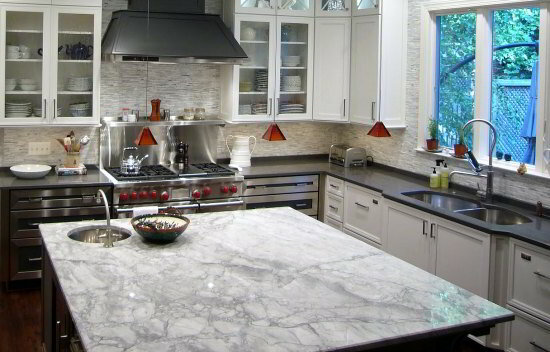 White Fantasy Granite is the closest granite I have seen to Carrera Marble. We also liked Carrara White and ended up picking Kashmir White granite - there's the dotted variety that Home Depot sells, but you can find a slab with very nice vein if you go to a stone yard. It's considered entry-level granite, but it's not boring like other types of granite in the same category - the gray and sometimes dark purple veins give it character. It can also save you a bundle - we got it for $39/sq.f. === Admin comment: Kashmir really doesn't look anything like Carrara marble except that it is somewhat whitish... but on a more important note... Kashmir also absorbs liquids like a sponge. Very difficult to seal. One of a very few granites that just should never be installed since it will stain so easy. Many like the look, but it's a bad choice. I saw a Corian sample called "Rain Cloud" which is probably the closest you'll find, but it does not come close as far as the shine and veining. Corian that looks like Carrara? Hi. Can you tell me which Corian looked like Carrara? I recently saw in a kitchen design store a sample of granite called "palisades". It looked just like carrera. I also saw a Corian sample that too looked like carrera.